Facebook is constantly changing. This means that it is difficult to stay updated with what is “allowed” on the platform and what is not. For experienced Facebook gurus, mistakes on social media are something they see every single day. What is most surprising though, is that many of these mistakes are not being committed by some startup or small business with a small marketing budget. This is a sign that mistakes on Facebook can be made by anyone. From startup to marketing professionals. However, they can be prevented by simply becoming aware of them. And that’s exactly the reason why I decided to write this article – to help you become aware of the most common Top 9 Mistakes Brands Make When Using Facebook Ads, so you can avoid making them, and therefore seriously harming your brand. Of course, there are too many mistakes to mention them all, however, I will bring up the most common ones, and the ones which are most harmful to your brand and can be the most disastrous when making them. This is probably the most common among brands when it comes to Facebook ads. Facebook outlines marketing objectives companies may have very well, but still, we see brands who are failing with setting up clear goals with their marketing efforts and what they wish to gain from them. If brands, on the other hand, succeeds in setting clear goals, it will be much easier to measure if those goals were reached and to work effectively towards them. The days where marketers decided what the consumers would see are over. Now, consumers have a bigger freedom of choice than never before. It is the consumers who choose what they want to see on Facebook, and if you succeed in delivering it to them, they’ll stay and become long time supporters. If you, on the other hand, don’t succeed with this, which a lot of brands don’t, you’ll end up shoving your ads down their throat, pushing your audience further away from you as a result. Make sure your ads are relevant to your audience and don’t be too promotive with your ads (even if it might sound strange). Sometimes, ads which are providing more value to its viewers, than they are marketing a product generates better results. Facebook offers a ton of criteria which you can use when setting up your campaign and deciding who you will target with it. Before you set up your Facebook ads, it’s important that you know your audience very well. If you don’t know your audience, might have some big issues, and Facebook ads might be a complete waste of your money. Because who you’re going to target will be a guessing game. Try out Google analytics and start engaging with your audience to learn what habits they have and who they actually are. You should also define your target audience according to you. What habits to they have? Now that you’ve defined your audience, you should set up your Facebook ads accordingly. Don’t go targeting 60-year olds if your target audience if your target audience is 20 year-olds. If you choose a particular interest, for example, you’ll often be presented with more precise criteria based on what you chose. 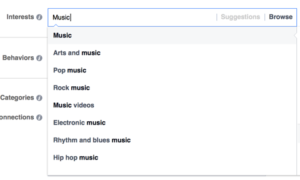 Let’s say you write “Music”, then you’ll be presented with different genres to choose from. The more precise you are with your ads, the higher ROI you’ll get. Not doing enough research about your target Audience and their behavior can lead to a lower ROI than expected ROI. To be able to target them, you need to understand their habits on Facebook and where they are spending their time in order to use the best methods and criteria to reach them. Your Facebook ads should be personal and speak to your targeted audience on a personal level. Making your ads impersonal will make them see your ad as “just another ad” and nothing else. However, making your ads personal and engaging can have a tremendous effect on how your ad is being seen, as a personal ad can make them go “oh, are they talking to me?” and therefore result in a higher conversion rate and better overall results. Impersonal ads might work short-term, but they are definitely not helping you reach your true potential, and are certainly not giving you the most bang for your buck. A wise man once said “You can’t manage what you can’t measure”, and he couldn’t be more accurate. Measuring results is critical for Facebook success, therefore, it was obvious to name it in this list of Top 9 Mistakes Brands Make When Using Facebook Ads. Spending thousands and thousands of dollars on ads and not knowing how well they performed is not too uncommon, unfortunately, and those brands are missing out on huge opportunities because they could be getting much more bang for their buck if they just measured results and tweaking their campaigns. Some brands are afraid that measuring results is difficult, and sometimes even “impossible”, and is therefore completely ignoring it. However, the fruit result measuring can bring you is far more worth than the effort it takes. And best of all… Facebook offers a great analytics tool which simplifies result measuring so even a child can do it (almost). With the help of this tool, you can measure things like reach, click-throughs and website clicks (link clicks). However, that’s not all. That’s just scratching the surface. With the Facebook Analytics tool, you can also see things like retention rate and demographics. By implementing analyzing of your campaign by using the Facebook analytics tools, you’re already way ahead a lot of your competitors, and best of all is that when you fully master the analytics tool and start to retarget your ad’s target audiences, you can get better results than those with a considerably bigger marketing budget. If you can’t beat them – outlearn them! Every successful Facebook ad has a clear call to action. Why? Because if your audience doesn’t know what you want them to do when they see your ad, the chances of them actually doing something decreases. When you have built your audience’s interest and sometimes even made them eager to buy, leaving them hanging is a costly mistake. Having an appealing call to action is not that difficult as it might sound. Think about what you want them to do, and ask them for it – but don’t shove it down their throat. Ask politely, but make it easily understandable. Don’t try to sugarcoat your question, because people will be able to see through that. 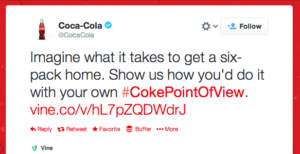 Here’s a clear call to action by Coca-cola. First, they give their audience a brief description and then present the call to action. Can you see which the call to action is? That’s how clear it should be. Nothing kills ambition more than expecting unreasonable results – because you’ll never reach them. While Facebook ads can generate tremendous results for your brand when used correctly and tweaked to perfection, one must know its limits – especially you have a limit, in terms of a budget. Before you begin, learn what Facebook ads should be able to generate to you and then based on that set your goals. Your campaign is a conversion, not an ad. And your ad will probably result in a bunch of new followers, comments and questions. So make sure you answer them! Responding to your audience’s comments and questions not only help you increase your overall engagement, but it can also be the conversing factor that makes them a customer. A good response can also be what makes them decide whether or not they can trust you. If your customers feel like you’re ignoring them, their perception of you will be carried on to your website, and by instead providing a killer customer service, they’ll feel like they’re in safe hands when shopping from you. An entire book could be written on what not to do when using Facebook ads but make sure you look out for the pointers above and perform them correctly and you’ll be well on your way.